One of my goals for 2014 was to create a little series for my blog and stick to it for the year. Today, I introduce you to "Beauty Battle!" Some of my most viewed posts are ones were I review and compare 2 or more similar products. I've decided that i'm going to take three products which vary in price (budget, drug store and high end) and review them and compare them againest each other. This way you can see what's worth spending on and what you can save on. 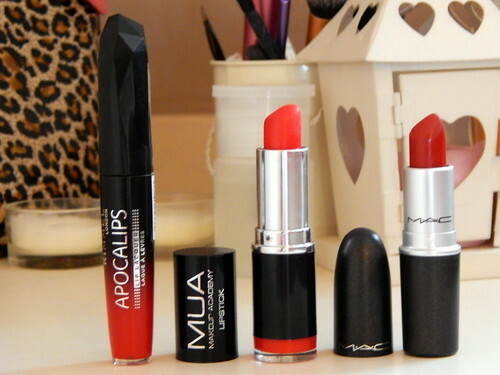 I'm going to start January with red lips! Nothing can make you feel more 'done' than a red lip. I've taken 3 pretty well known lippies and i'm going to let you know the good, the bad and the ugly all in this one post. This is the first 'liquid lipstick' that I bought and i'm so glad I did. The colour is a perfect true red, although some what glossier than other classic reds I've tried. It applies perfectly without dragging the lips and the wand applicator is shaped perfectly for one coat colour. Although I said it's slightly glossy, it isn't sticky and the wear of this lipstick is ridiculous. Once it's applied it lasts for a good 4-5 hours without re-applying, whilst eating and drinking! They only downside to this is that I don't find myself reaching for this during the day as I think it's a bit more suited to night out makeup. Let's start by mentioning the fact this lipstick costs £1! Yes, you read it right, £1. I'm not even sure what else you can buy for £1 in this day in age. Basically, this lipstick is perfect for everyone mainly for the price but i'll go on to the good stuff now. This again is a bold, true red (the swatch below doesn't do it any justice) however it doesn't have the glossiness of the Apocalips. Mua do know how to make their products pigmented and this is no different, lasting a good couple of hours without reapplying. I do sometimes find this difficult to apply as it can bleed out and end up looking like you've thoroughly enjoyed tomato soup for breakfast but nothing a lip liner can't sort out. Ever since my addiction to Mac way back when, Russian Red has had a continuous spot of my wish list. Compared to the other two, this is much more of a blue toned red - perfect for whitening the appearance of your teeth. Although this is a matte lipstick, it isn't as drying as other Mac lipsticks (you know the one). Again, it doesn't drag on the lips but like Mua's shade 13, it has a tendency to bleed. It last's on the lips longer than Mua but not as long as Rimmel however it's pigmentation is just as good as both. All three lipsticks are lovely in their own right and i'm glad I own them all however, I like them all for different reasons. If money is no option for you then Russian Red is the perfect red for you; pigmented and long lasting with gorgeous colour pay off. 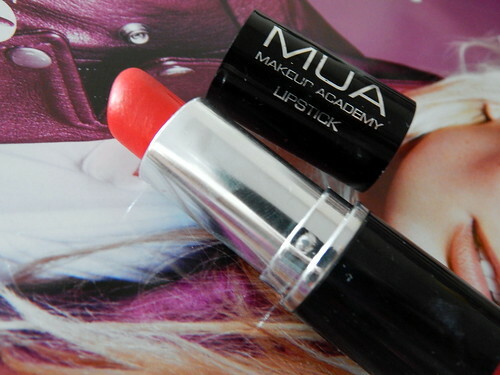 However if you're not quite a mac budget kind of girl then the Mua lipstick is definitely not a poor replacement. For £1 you'll get a classic red that lasts! 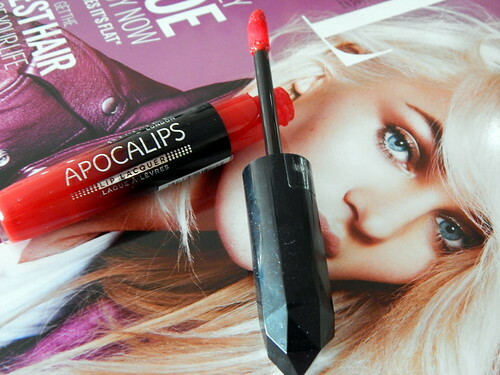 Finally, if you're a drug store lover than Rimmel's Apocalips will steal your heart. I would certainly pay more than £6 for this lipstick, you get what you pay for and more with this! Which of these lipsticks is your favourite? 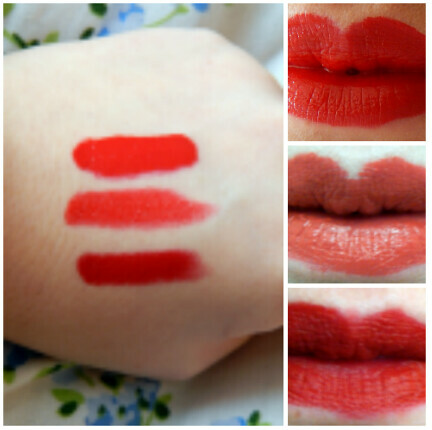 I have all 3 of these and use them all Russian red is my favourite but I take the MUA one out in my handbag for a top up as I dont want to lose my MAC. 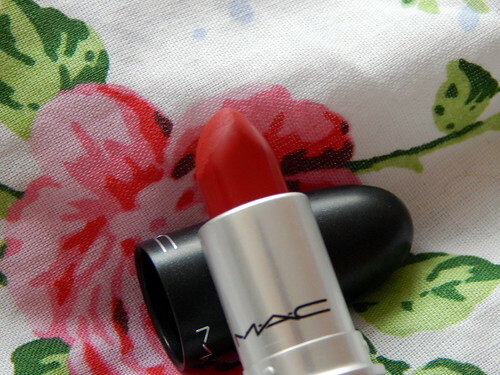 Mac Russian red is such a classic colour! I would love to own it however I am not sure how I would pull off the look!